Hezbollah Recruitment in Eastern Deraa? One of the main concerns regarding the Syrian government's campaign to recapture the rebel-held parts of Deraa and Quneitra during the summer of this year was that the campaign would allow for an expansion of the influence of Iran and its Lebanese client Hezbollah in southern Syria, arguably posing a threat to Israel in particular. Ultimately though, it would appear that the Russians assuaged Israeli concerns with pledges that Iranian-backed groups would not participate in the final southern offensive and would be kept away from the border with the Golan Heights. There are some claims of more recent, expanded recruitment of non-Shi'a locals by Hezbollah in eastern Deraa countryside. For details related here, I am mainly reliant on the testimony of an activist who is currently present in the eastern Deraa countryside. According to this source, Hezbollah recruitment in the eastern Deraa countryside began in late summer 2018 in the east Deraa town of al-Masaifara, with a contingent led by two locals: Muhammad al-Masri and Sa'ad al-Awda. Initially, this contingent consisted of twelve people and it has now expanded to thirty people. In addition to al-Masaifara, local contingents for Hezbollah have also been recruited from al-Lajat, Mahajja, al-Mlaiha al-Sharqiya, al-Mlaiha al-Gharbiya, al-Hirak, al-Karak al-Sharqi, al-Jiza and Saida. Some of those recruited have since been deployed to frontlines in Hama and Idlib. Training for these Hezbollah contingents has taken place in the al-Lajat area. Besides Muhammad al-Masri and Sa'ad al-Awda, another reputed individual involved in Hezbollah recruitment in east Deraa countryside is Osama Zaid al-Nu'ama, originally from al-Karak al-Sharqi. He is said to divide his time between Syria and Lebanon. However, the same source says that the Hezbollah-affiliated contingents by no means represent the majority of youth or former rebels recruited to various formations in east Deraa countryside. The V Corps and 4th Division have attracted more recruits. In addition, some people are preparing to enter into the regular compulsory military service. In the open source realm, two videos have circulated on social media purportedly showing the training and graduation of Hezbollah-affiliated fighters, both allegedly from the locality of Eyeb in the east Deraa countryside. In the first video that lasts for just over four minutes, a Syrian army brigadier general addresses a contingent of a few dozen fighters. 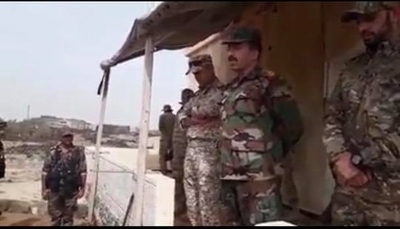 Screenshot from the video of the brigadier general addressing the graduated fighters. Contact the author for the full video. "I thank you [the fighters graduating], I thank the youth [indicating those to his left] for the efforts they expended...and those accompanying from some of the youth from the very beginning of the crisis with us...they came...and they fought with us, fought battles, and offered martyrs, all in the path of supporting our homeland country. Those are our brothers from the outset, not like the Saudis, the Gulf and states that stood against our country...the best people of the Arab nation are the Lebanese and Syrian people, followed by the Iraqis...we are a people of civilization." For their own part, the fighters chant the familiar pro-Assad slogan of "with blood, with soul, we sacrifice for you, oh Bashar." The second video, lasting nearly nine minutes, is less remarkable, largely showing scenes of gunfire with some dialogue in the background that is difficult to comprehend. 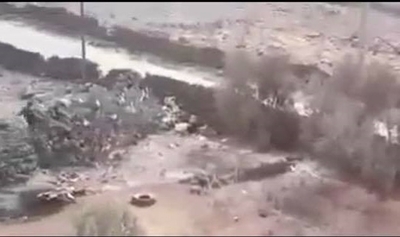 Screenshot from the video purportedly showing training of Hezbollah-affiliated fighters in east Deraa countryside. Contact the author for the full video. The first video is clearly of greater interest, as it may seem confusing at first sight that a Syrian army brigadier general would address an apparent contingent of Hezbollah-affiliated fighters. Here, there are two possible explanations for the video. The first explanation is that they may merely be Syrian army recruits who have received training from Hezbollah, which has played a role in training forces in Syria beyond groups affiliated with it, partly to make up for the deficit in Syrian military personnel who can provide training. The second explanation is that the contingent is Hezbollah-affiliated and is within the Local Defence Forces (LDF), which can be described as a joint project between the Syrian military and the IRGC and Hezbollah. In short, some detailed claims exist regarding Hezbollah recruitment in east Deraa countryside but so far have proven very difficult to corroborate. In addition, the sources of information tend to very partisan in favour of the opposition. The circulated figure of 2000 recruits is almost certainly a large exaggeration. A friend in al-Karak al-Sharqi could not confirm the existence of a Hezbollah-affiliated contingent recruited from the town. Meanwhile, the mukhtar of al-Karak al-Sharqi, who had long been known as an advocate of 'reconciliation' with the Syrian government, denied to me that there was any Hezbollah recruitment of people from his town. Conversely, I remember hearing in early September, before this issue had garnered some wider attention, about "persons who have joined Hezbollah" from 'Qaysar Habib'- an activist sympathetic to the opposition and best known for covering the period of Islamic State rule in the Yarmouk Basin in west Deraa countryside. Currently residing in his hometown of Tasil in the Yarmouk Basin, 'Qaysar Habib' did not offer specifics beyond a general comment about individuals joining Hezbollah, while noting that others had signed up to the regular army, military intelligence et al. However, he did deny that people from Tasil had joined Hezbollah. Analytically speaking, it is logical that Hezbollah would seek to extend recruitment in Deraa beyond the small Shi'a communities in order to cement influence in Syria as part of the Assad-led order in the long-run. In the end, the demographics of Syria remain predominantly Sunni, and both Hezbollah and Iran cannot ignore that fact if they want to ensure lasting influence. This does not mean that Hezbollah and Iran have no interest in converting people to Shi'i Islam. After all, Iran in particular is known to engage in proselytization efforts. But it is also clear that there will be those who join formations affiliated with Iran and Hezbollah for reasons such as employment and earning a salary, without an interest in converting to Shi'i Islam. For comparison, one should note the phenomenon of Liwa al-Baqir, which originated in Bekara tribesmen in Aleppo province who had converted to Shi'i Islam. Liwa al-Baqir is among the most well-known LDF formations, and has expanded recruitment beyond its home base. At least some of the influx of new recruits to Liwa al-Baqir is tied to conversion to Shi'i Islam. Any attempts by Hezbollah and Iran to recruit locals in southern Syria should thus be seen as part of a long-term project, in which their influence becomes an indivisible part of the system in Assad's Syria, rather than overthrowing and replacing that system. As for the Israel angle, it is notable that the alleged Hezbollah recruitment is occurring at some distance away from the border with the Golan Heights, and so the idea of building up a force to threaten Israel is probably not the immediate priority, as attested also by the claims of deploying fighters to the Hama and Idlib fronts. Instead, the Israel angle may be something to bear in mind in the long-run.